Gluten free, good quality (organic) grains are one of those things that can really help me switch things up when I get bored, and don't give me much if any consequences in terms of my digestion or energy levels. When I polled you guys over on Instagram, it sounded like many of you were in the same boat (over 85% to be exact!). Many of you DO include grains in your diet. 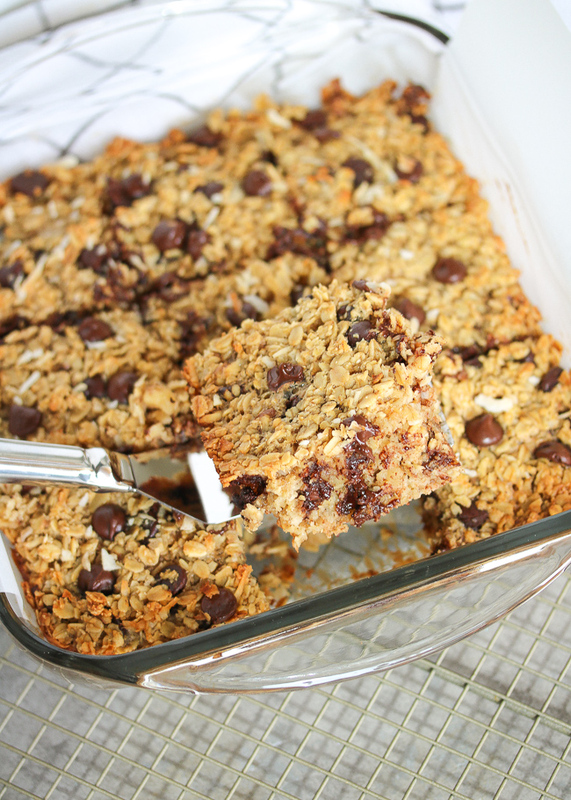 And even if grains aren't a day-to-day thing for you... how good would these be for a little treat or to switch things up? Chocolate + coconut anything is a straight path to my heart. But baked into this warm, hearty breakfast (that tastes like & could totally be dessert), it's just perfect. 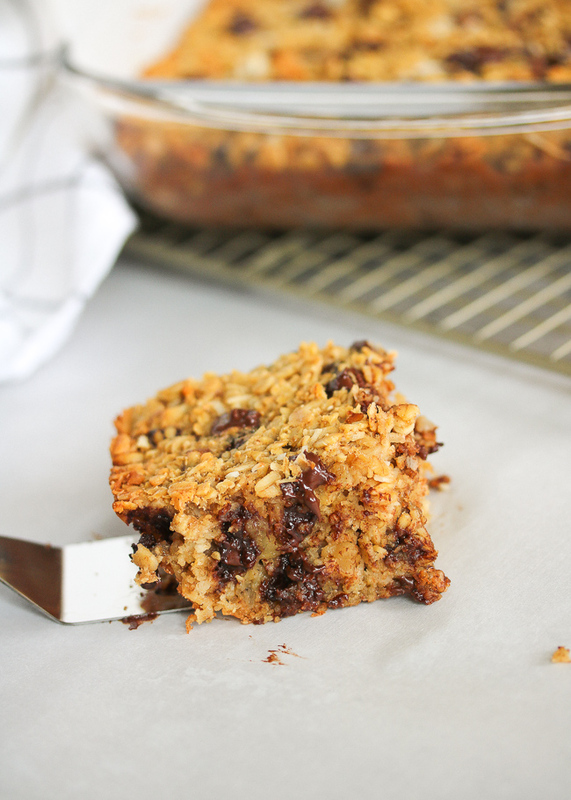 Looking for something less chocolatey, more fruity? Switch up your mix-ins! Wondering if you'll like this? Well... do you like oatmeal cookies? That's just about exactly how this tastes! It's honestly too good to be true. I dare you to eat just one serving! Preheat the oven to 350ºF. Grease a 9" square baking dish with some melted coconut oil or ghee, or line it with parchment paper so the oatmeal doesn't stick. 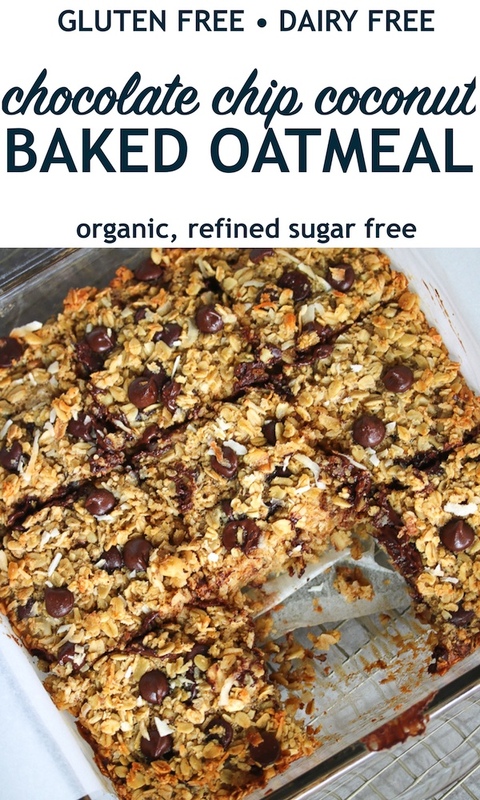 In a large bowl, combine the dry ingredients: oats, baking powder, cinnamon, nutmeg, and salt. In a separate bowl, whisk the eggs, honey or maple syrup, melted coconut oil or ghee, milk, and vanilla extract. Add the wet ingredients to dry, and mix until combined. Stir in your mix-ins until well incorporated. Transfer the mixture to the greased baking dish, and top with a few extra chocolate chips & some shredded coconut if using. Bake for 35 minutes or until light golden on top & around the edges, and firm in the center. Slice into 9 to 12 squares and serve! Store leftovers in the fridge. 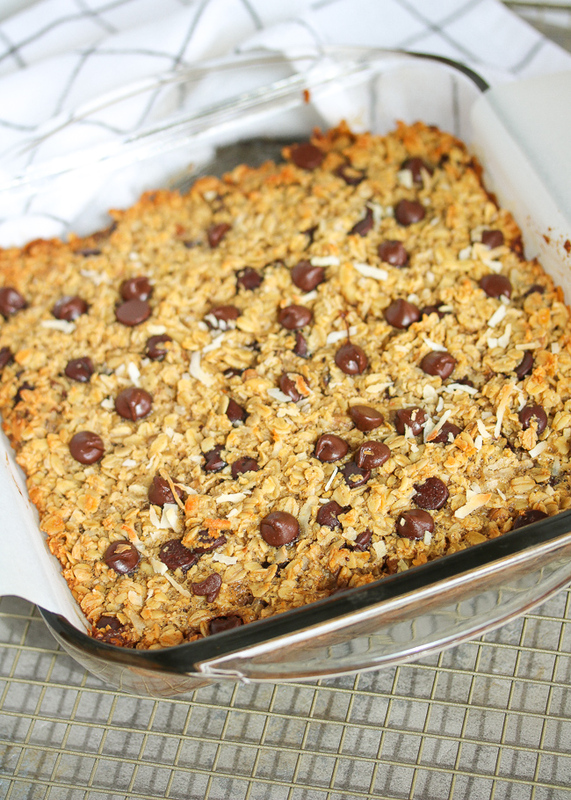 I use coconut milk in this recipe, but you can substitute whatever milk you like! Cashew or almond are two other great dairy-free options. For extra flavor, try the french vanilla or caramel flavored Nutpods! I buy those HERE. For mix-ins I would choose around 3, but feel free to mix them up to change the flavor profile! 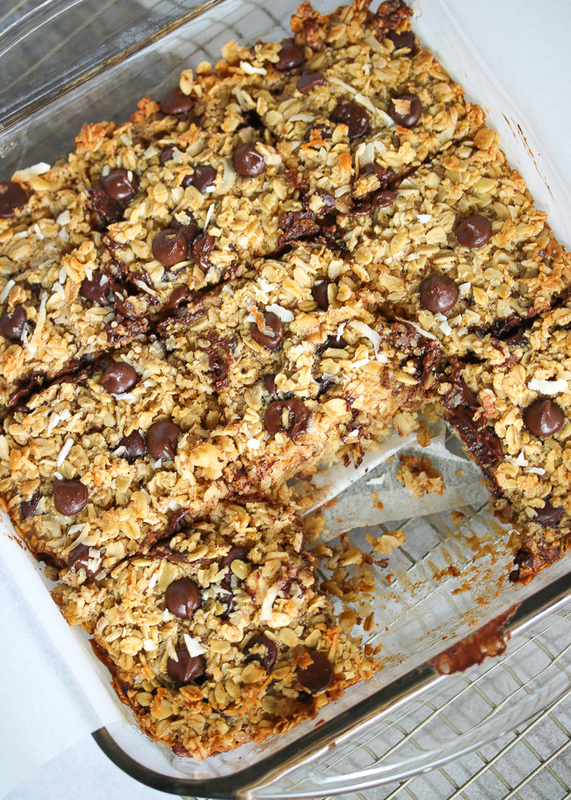 I used chocolate chips, shredded coconut, and chopped walnuts in this batch. Get creative & do whatever flavor combo you like! Try dried fruit, fresh berries, peanut butter, or chopped bananas. Bake the oatmeal according to above directions, then allow it to completely cool. Slice into squares and wrap individually with plastic wrap then a layer of foil to keep the air out. Freeze! To reheat: defrost overnight in the refrigerator. To warm, heat in the microwave or in a 350ºF oven until heated through. Oh no! Thanks for pointing that out, Chelsea! I should have listed that in the dry ingredients step. I'll go update now! They'll still be good!! :) Enjoy! Very awesome recipe! My mom whipped this up for me this week, as I am 2 weeks postpartum with my second child, and need easy breakfast and snack options. So quick to heat up and devour! And delicious! 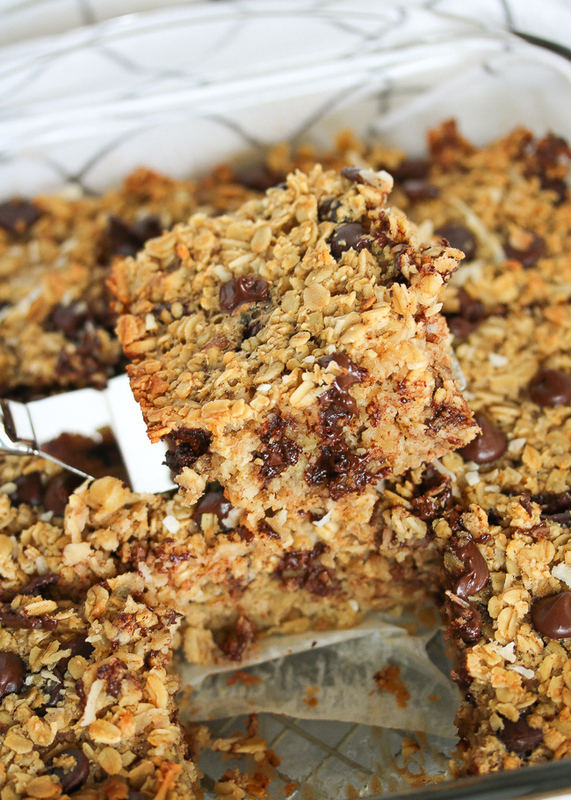 We added coconut, walnuts and a few chocolate chips for add ins! I’m sure the oats help with making the milk now too! Thanks for a great go-to recipe! I will surely make this over and over. Hello! The instructions say to store leftovers in the fridge, is there a reason for this? I left mine out overnight and I'm slightly worried that maybe there was a reason it needs to be refrigerated. Hi Christine! I personally always refrigerate any baked good (or any type of dish) that is fresh and has a lot of moisture to it - so it doesn't go bad or grow mold quicker than I'd like. I'm sure it's fine overnight, but I would stick it in the fridge now if you can! Hope you enjoy!